Every week we pull together some great Canadian recipes from Canadian food bloggers around the web featuring one main ingredient or dish. Dining solo can be a great way to take a little "me" break in your day so today we have 13 delicious meals for one to tempt you into the kitchen. 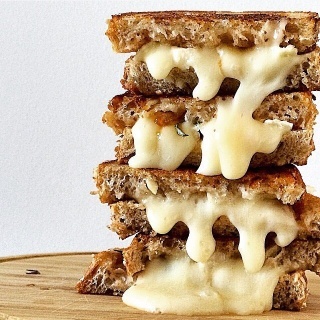 Sandwiches are an easy meal for one but why not celebrate Tuesdays (or Wednesdays or any day) and get really decadent with a **[Grilled Cheese with Brie and Passionfruit Jam](https://everydayonoccasion.wordpress.com/2016/08/10/grilled-cheese-with-brie-and-passionfruit-jam/)**! From **Everyday On Occasion**. A twist on the traditional Caprese salad, this **[Avocado and Beet Caprese Salad](http://yummybeet.com/avobeetcaprese/)** packs in everything you need to make a satisfying meal. From **Yummy Beet**. Wonderful comfort food for one with little effort. That's what this **[Lentil Spinach Masala](http://www.thebakingskillet.com/lentil-spinach-masala-meals-for-one/)** brings to the table. From **The Baking Skillet**. Oatmeal doesn't have to be for breakfast. Try a savoury version like **[Soft Boiled Egg Savoury Oats](http://eat-spin-run-repeat.com/2017/02/15/soft-boiled-egg-savoury-oats/)**. From** Eat Spin Run Repeat**. Tacos are a really quick and easy meal for one and you can change up the fillings based on your pantry. Try these **[Easy Fish Tacos](http://www.aheadofthyme.com/2016/08/easy-fish-tacos-lime-crema/)** for a quick dinner. From **Ahead of Thyme**. Sometimes, all you need is a really "big" salad with "lots of stuff in it". This **[Prawn Salad with Sesame Dressing](http://www.aheadofthyme.com/2016/08/easy-fish-tacos-lime-crema/)** will fill you up! From **Jo and Sue**. A quick and easy **[10 Minute Soba Noodle Bowl](http://www.picklesandpotstickers.com/blog/quickie-lunch-soba-style)** that tastes as delicious as it smells. From **Pickles and Potstickers**. For when you want dessert for one but don't want to do a big baking session - the **[Salted Caramel & Chocolate Brownie Microwave Mug Cake](http://www.theoliveblogger.com/2017/02/08/microwave-mug-cake-recipes/)** will fit the bill. From **The Olive Blogger**. Breakfast is one of the easiest meals to get indulgent for one. Try a **[Dutch Baby Pancake](http://www.chocolatesandchai.com/dutch-baby-pancake/)** like this beauty. From **Chocolates and Chai**. When dining solo, bowl meals are the best! They look fancy, they taste delicious and you can put almost anything you want in them! Try this **[Brussels Sprouts Brown Rice Bowl with Cilantro Lime Drizzle](http://www.bakersbeans.ca/brussels-sprouts-brown-rice-bowl-with-cilantro-lime-drizzle/)**. From **Bakers Beans**. Fight those nasty cold and flu bugs with this **[Mango Turmeric Kombucha Soothie Bowl](https://alushlife.ca/home/mangoturmerickombucha-smoothie/1/2/2017)** for one. From** A Lush Life**. No need for takeout when you can easily make this **[5 Minute Ukrainian Breakfast Sandwich](https://foodmeanderings.com/2017/03/09/ukrainian-breakfast-sandwich/)** before heading out the door in the morning! From **Food Meanderings**. Who says the only way to have potatoes at breakfast is hash browns? Why not a smoked salmon, will and sour cream baked potato? The **[Brunch Baked Potato](http://www.hotstuff.recipes/recipes/side/potatoes/brunch-baked-potato/)** is a perfect way to start the day - or even end it. Baked Potatoes are extremely versatile. From **Hot Stuff**. A big thank you to all our FBC Members who participated in this week's meals for one roundup!